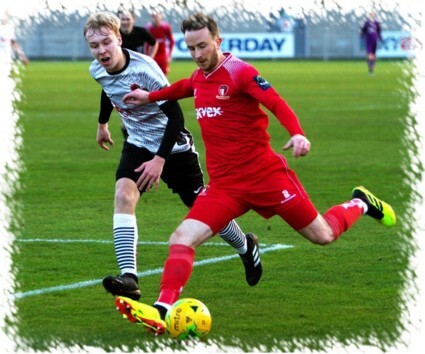 A crushing 6-0 Hayes & Yeading victory at the SKYex saw United sitting pretty at the top of the Bostik South Central table at Christmas as Paul Hughes' side continue their push for the title. 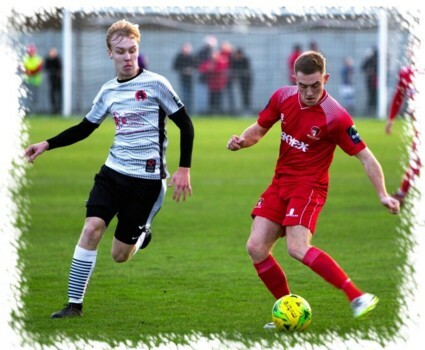 United's starting XI changes amongst others saw a return from injury for Tom Jelley plus a return to the club for 2015/16's top scorer and player of the year Elliot Benyon who has rejoined from Leatherhead. It was however another reinstated to the starting XI in the shape of Josh Chamberlain who set United on the way in just the fourth minute as he chased a long Tom Jelley through ball, defender Jamie Richards passed back to his 'keeper Matte Pierson but the ball somehow went through his legs leaving the United man to walk the ball into the vacant net. Another opening came United's way shortly after when Liam McDevitt was first to a Scott Donnelly corner only for his glancing header to drift wide of the target. It was 22 minutes before another chance came about, this time going the way of the Sports as Mustafa Tiryaki flicked on a Tim Pitt free-kick to Scott Harris, the striker volleying over without troubling Andrew McCorkell in the United goal. Pitt again troubled the United defence a couple of minutes later, this time his driven free-kick from 25 yards forcing a diving save from McCorkell with the resultant corner coming to nothing. United were soon on the charge once again, Little burst past Will Plumridge on the left wing before picking out Bridges in the centre but he fired wide, a minute later though United's lead was doubled. Donnelly fed the ball left to Little, this time instead of making for the bye-line, the United wing-back broke inside and curled a perfect right footed shot around two defenders and Pierson into the bottom far corner of the Sports net. 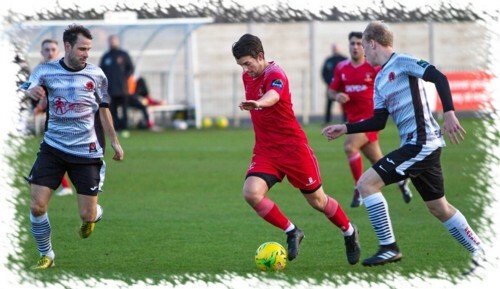 A nice United move on 34 minutes saw Ed Asafu-Adjaye play the ball in to Elliot Benyon, he in turn found strike partner Lee Barney who saw his driven shot tipped wide by the outstretched boot of Pierson. The resultant corner kick was played short to Bridges, his curling effort was pushed away by Pierson with a stretching Barney putting the rebound wide with a diving header. A minute later and Sports' striker Charlie Postance tucked home a Abdeen Abdul cross only for an offside flag to cancel out the strike to leave United with a two goal advantage as the half-time whistle blew. United were given a further bonus as the whistle blew with Postance being adjudged to have deliberately kicked the ball at Barney and a straight red card was shown to the Sports striker by referee Holden. 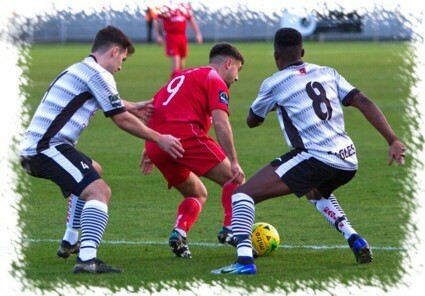 Just three minutes after the restart, Benyon inadvertently denied Tom Jelley a first goal for the club, the striker unable to get out of the way of a drive that nearly "took his head off" in front of goal, the shot going over the top. United pushed again, Little's free-kick firm the right was partially cleared as far as Bridges, Pierson grasping the shot at the second attempt after an initial fumble. As the hour mark approached the Sports created a couple of openings of their own. Substitute Simo Mbonkwi was put through only to be denied by the alert McCorkell who was quickly out to tackle the striker and a minute later Tiryaki received the ball in the right channel, shooting across the face of the United goal and wide of the far post. On the hour though United were once more on the scoresheet, Bridges broke into the Sports area only to be unceremoniously chopped to the ground by Stuart Lake. Donnelly stepped up and sent Pierson the wrong way from the penalty spot. Five minutes later Donnelly was spot on once again, firing home from the spot after Bridges chip charge into the box was cut out by the hand of Sports skipper Jamie Richards, this time the United skipper sending Pierson the opposite way with the same result and United had four. Four soon became five just two minutes later. Bridges and Benyon combined on the edge of the box, the latter sliding the ball through to Barney who fired home his 21st of the season from a sharp angle. Still United piled forwards, Chamberlain instantly killed a Little pass and drove the ball within inches of the goal from 20 yards out and a minute later Pierson was beaten again. Jelley crossed the ball in from the right, Benyon helped it on to Barney who found the arriving Little who cracked home his 13th of the season from his wing-back position. With six in the bag, United seemed to relax a little and the two best chances in the closing fifteen minutes both fell to the visitors. Abdul broke past Roddy Collins on the left and found Mbonkwi who saw his shot defended en route to goal by an excellent Chamberlain sliding block, the ball however was quickly returned to Mbonkwi by Tiryaki but having turned his marker he sliced his shot wide. Thirteen minutes from time McCorkell handled a back pass under the misapprehension that it was a goal-kick, an indirect free-kick being awarded seven yards from goal. With United all lined up on the goal line the ball was rolled to Joe Jackson but his shot was blocked well by a flying McCorkell with Duncan Culley completing the clearance. At the final whistle it was still 100% in the league at home for United, 41 goals scored with 3 conceded and now sitting top of the pile with 3 games in hand.